China has more caves than any other nation. Most travelers consider the Reed Flute Cave (situated just outside the city of Guilin) to be the most interesting. 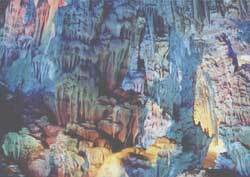 Reed Flute Cave has remarkable stalactites, stalagmites and other rock formations in a myriad of fanciful shapes. The cave was popular with tourists and poets about 1300 years ago during the Tang Dynasty. Some wrote inscriptions on the cave walls, which can be seen today. The loud, disturbing sound of many tour guides using bull horns inside an enclosed space ruins the natural serenity of a cave. Tour guides overly focus on what the formations resemble (birds, animals, flowers, what have you) at the expense of conveying the beauty of the formations and explaining how they evolved. Taking the "use your imagination" approach is good, but it can be overdone. Many formations are overly illuminated with multi-colored lights, to the point of being somewhat kitschy. This masks and distracts from the cave's natural beauty.